The temple structure, built in Dravidian style architecture, has a gopuram with a height of 100 ft, and is one of the 108 temples dedicated to Lord Vishnu in India. Mural paintings of gods and goddesses adorn the seven-storey gopuram. This ancient temple, spread over a vast area, was renovated in 1733 AD by Raja Marthanda Varma, the then ruler of Travancore. This grand temple is associated with legends from the great Indian epic, the Ramayana. This magnificent temple is an architectural wonder. In this temple, Lord Vishnu declines in the posture of 'Ananthashayanam' on the coiled serpent 'Anantha', measuring 18 feet in length and is covered with gold and other precious stones. The massive idol is viewed through three different doors. The head and torso is visible through the first door. The midriff and hands are visible through the second door and through the third door, you can see the feet. This temple is a historic landmark of Thiruvananthapuram. There is a picturesque pond located close to the Sree Padmanabhaswamy Temple. Sree Anantha Padmanabha Swamy Temple is famous for its Arattu festival, headed by the royal family of Travancore. The festival is a grand spectacle of beautifully decorated elephants and musicians chanting Lord's name, attracting large number of people. Navarathri Festival of musical concerts is held at the Navarathri Mandapam, during October-November. Both Budget and Luxury Hotels are available in Thiruvananthapuram. By Air: The nearest Airport is Thiruvananthapuram. By Train: The nearest railway station is Thiruvananthapuram. By Road: Thiruvananthapuram is well connected by roads to all major cities. The year 2011 marked an important year for Sree Padmanabha Swamy Temple. In July 2011, the newspapers and televisions made big headlines about he unearthing of gold in large quantities in the forms of coins, jewels,diamonds, precious stones and other treasures, in the vaults of the Vishnu temple. The total value was estimated as approximately 500 billion rupees ($11.2 billion US). Besides, 18th century Napoleon-age coins were also discovered at the temple. This has made Sri Padmanabhaswamy temple as the most wealthy temple in India. 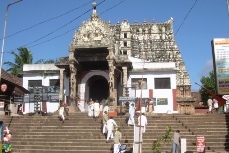 Until then it was believed that Thirupathi temple was thought to be the most wealthy temple. It was believed that these treasures were stored by the royal family who were erstwhile rulers of Travancore princely state. It was reported that the value of the total unearthed treasure from the secret cellars of Sree Padmanabhaswamy Temple is estimated above 90,000 crore assets.